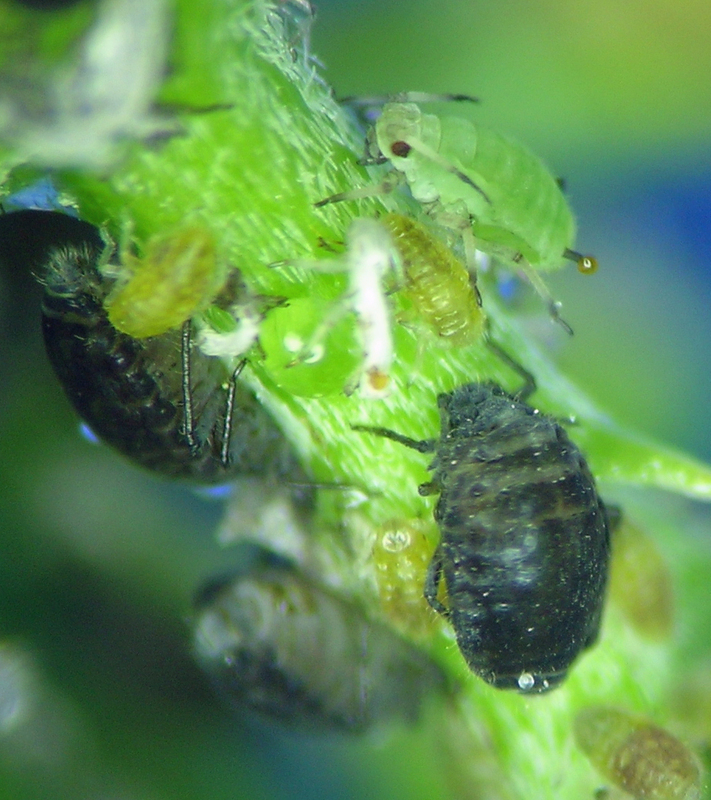 Anoecia fundatrices and offspring on Cornus in our yard in SW Idaho. The green aphid on the top is an immature Aphis carduella. This is a genus that is very easy to recognize in the field and in the lab, but one for which I have not learned the species taxonomy. Based on the blanks in knowledge of life cycles and host alternation of some species in North America, it seems just beyond guesswork to put species names on samples of this genus. And, I am perfectly satisfied filing them all as “Anoecia.” Most of the specimens I have are likely to be Anoecia corni (Fabricius). Anoecia aphids are about the most predictably found groups — just turn over leaves of Cornus (dogwoods) in the fall and you are likely to see them. Alatae congregate on the leaves and produce their offspring — specialized, very small oviparae and males. Anoecia on Cornus in the fall in Pullman, Washington.